This is my sleeper life drain deck. There are a few built in combos and strong synergies that filter into each other if one route is lost. 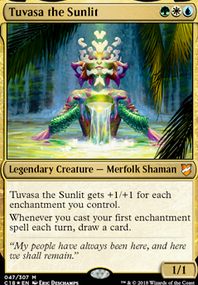 Although I’ve used Razaketh as a beat stick, he is mainly a tutor that feeds into the sacrifice synergies of the deck. Be political with this deck at first but then target the threat when you initially go off. It rarely plays at a fast pace, but once it’s ready to go off the game is won. Thrumming Stone - Guarantee playing all Apostles. If the stone isn’t an option for some reason, then use Secret Salvage + Edgewalker to get out all Apostles. Bontu's Monument in addition to this is gravy. Drop 25 Apostles, sac 6 to put into play Razaketh (you should have Athreos, God of Passage out during this for 6 triggers and more to come). If you have no mana sources left you’ll need to sac 1-2 for a land (and mix if you’ve already dropped land this turn). Sac also for cutthroat, artist, Dark rit, culling, servitude, and phyrexian altar. 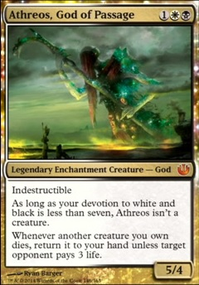 Don’t forget the Athreos triggers. If everything went well you should have 10-15 Apostles in play still depending on your game (rough estimate). Dark rit, cast cutthroat first, culling the weak, Athreos trigger, phyrexian altar, sac 1 to altar, blood artist, sac remaining apostles to altar, blood artist should target lowest life total, Athreos should also target lowest life total, zullaport hits all opponents, if the don’t pay life use black mana from phyrexian arena to recast the apostle and target lowest life total with artist and Athreos till their dead, use 4 mana (X is 1) if needed during this to cast servitude to repeat process. This is the long complicated play for the win. Grim Haruspex - Card draw as long as the opponent isn’t willing to pay 3 life. Target the lowest life total to get best results.